The political settlement that Fiji’s New Order regime is preparing to impose on its subdued society and decimated polity is a lousy outcome after 13 years of struggle and schism. Yet Australia, New Zealand and the rest of the South Pacific have little option but to persist in engaging with the regime as it bolts in place the narrow terms for next year’s election. The decision to engage is why Canberra is prepared to put up with the current bout of silliness from Suva over issuing a visa for the new Australian High Commissioner . A flawed and limited election in 2014 will be better than no election at all. Granted, it’s clear that the election will seek to enshrine the people and the interests of Fiji’s New Order. That outcome, however, was always in view. For Australia and the region, seeking accommodation with the regime is a sad acknowledgement that Fiji has been unable to save itself. In the contest between power and principle, power has triumphed. The relatively tough line Canberra has taken towards the Supremo and his regime since Bainimarama’s second successful coup in 2006 was based on two ideas. One was that with a bit of bashing and barracking, the military would go back to barracks. The other thought – both lofty and practical – was the commitment to a set of democratic understandings that have wide support and proven utility in the South Pacific. The back-to-barracks hope drew strength from the experience of previous coups in 1987 and 2000, when the military had acted reasonably quickly to hand control back to civilians. The second idea was that Australia and the region had to do everything possible to help any resistance to the coup culture that could be mounted from within Fiji by its people and institutions. The aim was to give as much outside assistance as possible to Fiji’s political parties, the courts, the churches, the chiefs, the media and the various elements of civil society. If Fiji could mount some resistance to the descent into coup-coup land, then the region had to do everything possible to help (hence the steady increase in Australian aid). Both those ideas have failed. The military and its cronies have entrenched themselves, and the regime has been extraordinarily successful in cowing and controlling other significant elements of Fiji’s society. The Supremo and his useful idiots have got a lot more mileage than they deserved from the old junta jingle that the soldiers had to kill democracy to save democracy; the Fiji version is that the military is slaying the old politics in order to deliver a new, multi-racial democracy. A clearer view of what has befallen Fiji is that one institution of the state has triumphed over all others. And, inevitably, that has allowed the colonels, the cronies and the carpetbaggers to cash in. To summarise a complex conundrum, here’s a brief description of Fiji’s New Order regime, with links to previous articles that lay out these arguments in more detail. The first concept (or conceit) is to see Bainimarama’s government as having similar elements to the New Order constructed by Suharto in Indonesia . As with Indonesia, Fiji’s New Order is built by a military that proclaims its dual function: to both guard and guide the nation. Secondly, Bainimarama has been constructing his New Order for 13 years, since his first successful coup in 2000—the George Speight coup attempt was foiled by Bainimarama’s more powerful coup . The construction effort has been shambolic and ad hoc (reflecting the Supremo’s intellect as much as anything) but the cumulative effect is in view. Bainimarama’s one clear achievement over these 13 years has been to place the military at the centre of Fiji’s society, administration and politics. The Supremo’s goal is to entrench himself and the absolute rights and special prerogatives of Fiji’s military. Thirdly, Fiji’s New Order is to make the logical step of expressing itself as a political as well as a military force. The military is about to show its dominance through the creation of a political party that will see Bainimarama ‘elected’ as Prime Minister. If quote marks can ever have ironic effect, then put them around ‘elected’ in this context. Next year’s election will give the New Order a useful political carapace. With Fiji’s old political parties barred, the military will be able to offer its own version of Suharto’s Golkar Party . Suharto created Golkar as the regime’s parliamentary vehicle (Golkar from golongan karya, or ‘functional groups’) drawing together hundreds of groups in society: rural workers, labour unions and businesses. Golkar enabled the army to create a party while claiming it was a new form of movement, not tainted by old party politics. The Suva Supremo will have no trouble denouncing the taint of old party politics while introducing his gleaming replacement version. The Supremo’s sense of entitlement mirrors that of the military he leads. 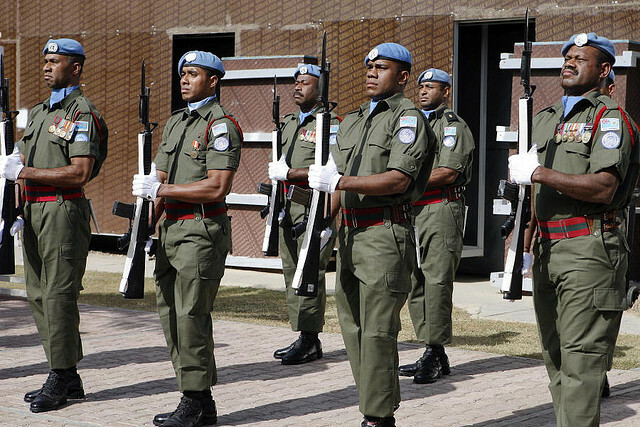 The former Fiji colonel, Jone Baledrokadroka, has written of the ‘inflated corporate self image’  of the military, built especially on its constant deployment on peacekeeping operations for the UN. One of the unintended consequences of the military’s international experience as a mediator of political tensions was the growing belief that it should perform the same role at home. The demands of peacekeeping inflated the size of the military just as it inflated its view of itself, making the military what Baledrokadroka calls ‘a state within a state.’ Under the Supremo, the boys in uniform have done away with the parallel bit and simply taken over the state. Baledrokadroka has been keeping count of the number of officers being shifted across to do top government jobs, from heading departments to running state bodies. The recent total he gave me was that 66 military officers are now doing senior civilian jobs across the Fiji Government. Bainimarama will merely follow the trend he’s imposed when he shifts from being Supremo to become the ‘elected’ Prime Minister. The big questions awaiting Fiji are about the size of the victory delivered to Bainimarama’s version of Golkar and whether the vote will have any impact on the habits and hopes of the New Order. Certainly, the colonels, cronies and carpetbaggers are set to dig in deeper, with their interests legitimised by a ‘popular’ and ‘democratic’ process. The rest of the world will have to take the election at face value, however unlovely the face. Graeme Dobell is the ASPI journalism fellow. Image courtesy of Flickr user United Nations Photo .